Launching the flagship project for sustainability in the textile sector on Thursday (16 October), the conservative politician hopes to assemble an offensive against ecological and social dumping in the fashion industry, together with German companies like Adidas, Aldi and Kik. But Müller is already under fire, as textile giants are rejecting the alliance, even though they have already been cooperating in a round table setting since April. The few companies which belong to Müller’s group only include medium-sized firms, such as the outdoor brand Vaude, and Hessnatur. “So far, the big corporations have not had the courage to be pioneers. But consumers will not accept that in the long-term,” Müller commented at an event to kick-off the new textile alliance on Thursday (16 October) in Berlin. Still, the minister is keeping the “doors open” and is hoping others will join in the coming months. Almost nothing has improved in the apparel industry since the collapse of the Bengali Rana Plaza textile factory one and a half years ago, causing 1243 deaths. “The textile alliance is a starting point for solutions that provide a livelihood, secure employment, ecological minimum standards and reject child labour”, explained Müller. “Cheaper is better” is not the mentality to have – “not for consumers and not for trade”, the conservative politician said. 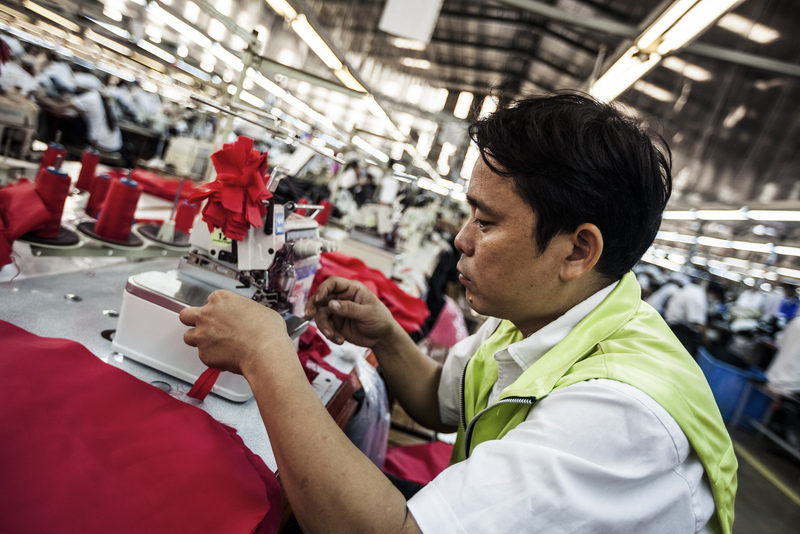 As a first step, those included in the textile alliance should develop measures to require producers in the first levels of the supply chain to look out for minimum ecological and social standards. In the longterm, the rules should apply to the entire supply chain, from the cotton field to the hanger. A second step is planned to create more transparency for the consumer. In January 2015, a consumer portal is expected to launch that will provide a quality check on the existing fair trade label for clothing. In the medium-term, Müller plans on developing his own social label. This label, that could be a “green button”, would be a sign to consumers who are against child labour and starvation wages in developing countries. Müller is convinced consumers should be able to choose fair clothing without the expensive price-tag. “We’re talking approximately one euro for every pair of jeans. If we are prepared to pay this euro, then women can send their children to school and ensure their health”, Müller stated. And, he said, the cheap jeans for €9.90 will still be around. But big apparel companies consider Müller’s plans “unfeasible”. This particularly applies to implementation of German social standards on a global scale as well as avoiding certain non-substitutable chemical substances. “Because of the complexity of the supply chain, transparency is hardly possible. Producing and shipping a men’s shirt, with all of its components, involves around 140 producers and logistics firms”, explained Uwe Mazura and Thomas Rasch from the General Association of the German Textile and Fashion Industry (t+m) and GermanFashion. Even the Trade Association of German Retail Trade (AVE) considered the alliance “not ripe for a decision”. Instead of overseeing the highly complex supply chains, the textile alliance should “concentrate on certain levels of the textile chain, so-called hot spots”, said AVE’s CEO Jan Eggert. Reiner Hoffmann, chairman of the Federation of German Trade Unions (DGB), did not give much credit to the companies and their excuses. Adidas, Puma and the rest are internationally networked corporations, who have access to significant logistical know-how. “Saying, ‘we won’t be able to manage that’, is not convincing. We expect more self-awareness and own responsibility,” said Hoffmann. The environmental protection organisation Greenpeace has distanced itself from the alliance because the latter does not contain a general ban on the use of toxic chemicals. The Worldwide Fund for Nature also criticised Müller’s plan. While the NGO said it welcomed the initiative, it explained that the alliance is a “quick fix”. Criteria for participation and decision-making structures have not yet been fleshed out, WWF pointed out. Meanwhile, Oxfam has said it considers the textile alliance’s action plan feasible and that sees the initiative as a signal to other European countries. “Many companies have already committed to requirements through other initiatives like Business Social Compliance,” explained Oxfam labour law specialist Franziska Humbert in a statement for EURACTIV Berlin. Humbert explained that is the reason why she does not understand the decision from big corporations, not to participate. The textile alliance is at a considerable risking of failing if corporations do not join, she said. “The success of the alliance crucially depends on having all the important actors in the textile sector on board,” Humbert pointed out. Should the big companies not join, Humbert said Müller will have to take legal measures, under which companies would be liable for non-compliance with minimum social standards in the supply chain. That includes effective implementation of the UN’s ethical guidelines on the economy and human rights as well as introducing a legally anchored due diligence for human rights. In this way, companies would be required to identify and prevent the effects of their activities and those of their suppliers. The EU textile and clothing sector is an SMEs-based industry as companies of less of 50 employees account for more than 90% of the workforce and produce almost 60% of the value added. In the EU-27 the biggest producers in T&C industry are the 5 most populated countries, i.e. Italy, France, UK and Germany, Spain accounting for about three quarters of EU-27 production of textiles and clothing. Southern countries such as Italy, Greece and Portugal, some of the new Member states such as Romania and Poland, and to a lesser extent Spain and France contribute more to total clothing production.